Halifax 57 Rescue (Canada) is an aircraft recovery and restoration group that operates world-wide and is international in its scope and mandate to save the Handley Page Halifax heavy bombers that flew with the RAF and RCAF in World War Two. From the early days of our group, when we set a world’s record for a heavy bomber underwater recovery with a lift of RAF Halifax NA337 from 240 meters depth in Lake Mjosa, Norway to the “impossible” but successfully completed deep swamp recovery of RCAF Halifax LW682 in Belgium, with her missing crew still on board, Halifax 57 Rescue (Canada) has done its duty to bring the legend and important history of the Halifax bomber back to the people of Canada and the world. Our mission is to bring home Halifax's to Canada and the historic aviation world for these Halifax's are the unknown and hidden symbol, thanks to the media and press, of the great effort and sacrifice of our RCAF and RAF bomber crews who gave all of us our Freedom and peace that we enjoy today. Aerial Achieve image of the original ditching of the LW170. In the years to come, as we search out our holy grail of RCAF Halifax LW170 laying in the deep off of Ireland as well as all the other Halifax's we can find, we will not rest for we know the following to be a fact. On every street, in every town of our nation, are families whose fathers, grandfathers, and uncles flew in bombers. The majority of these crew (in Canada over 60%) flew their beloved Halifax's, above all others, to Victory in World War Two. People all over the world long for a true symbol of the excellence and honour of their heroes in a just cause. 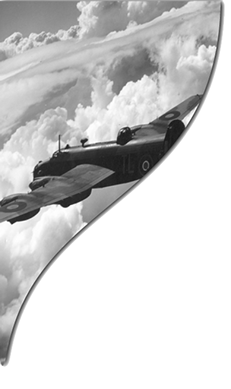 There was and still is no better symbol to Canada, and the world, of a mighty Sword of Freedom wielded by young warriors who defeated tyranny and it is the HANDLEY PAGE HALIFAX.